More than 30 students attended the second annual Cowley College Social Science & Business, Computer, Information Technology Day held Tuesday, October 20 on the school’s main campus in Arkansas City. There were three sessions offered and in each session was a choice of three mini classes. As students checked in for the event, they chose the mini classes they would like to attend. A handful of parents, teachers and counselors were also in attendance. Students from Ark City High School, Clearwater, Derby, Winfield, and Bluestem took part in the event. 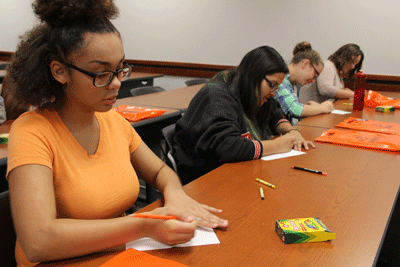 Brandi Gibbs, Cowley College admissions representative, said the students were impressed with the sessions. While Janet Davidson, director of early childhood education, said there is nothing better than getting into the lives of future students.